Stunning Connie Simonetti pure silk satin and Italian organza dress in ivory colour. Hand beaded Swarovski crystals and Swarovski diamantes. Dress is fully lined with built in corset, petticoat and zip up back with buttons over top. Dress was dry cleaned at Ferrari Wedding Gown Cleaners in Melbourne as per Connie Simonetti's recommendation and has been boxed since then. Can be bustled as per last photo. Swarovski crystal headpiece purchased from Connie Simonetti to match dress is included. It was an amazing dress to wear and it's too beautiful to sit in a box. 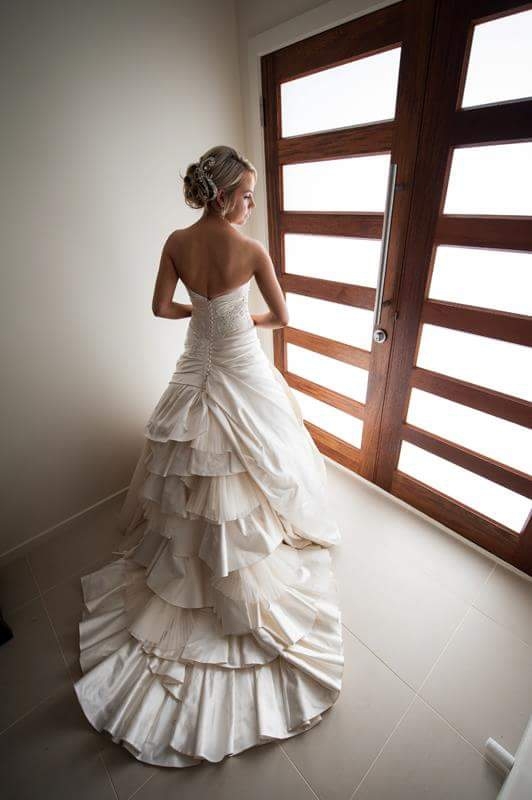 I would love another bride to wear it on her special day.